Eco Marine Power (EMP) is widening the scope of the Aquarius Eco Ship project, a low-emissions concept vessel, by inviting other companies to join the initiative. As part of this plan, a wider range of technologies will be studied including fuel cells, air lubrication systems and electrical propulsion, plus ship owners that are already indirectly connected to the project will be invited to participate more directly. The project, which began in 2011, focuses on optimising the design of a large ship such as a bulk carrier, oil tanker, ro-ro vessel or cruise ship, to harness the power of the wind and sun using Aquarius MRE. 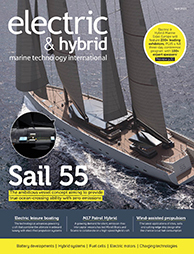 The centrepiece is Aquarius MRE (marine renewable energy) – an innovative and patented fuel-saving and emission-reduction system that incorporates a variety of elements including solar panels, energy storage modules, computer control systems and an advanced rigid sail design called EnergySail. Elements of Aquarius MRE have already been commercialised and it is expected that the expanded project will lead to further fuel and emission reduction solutions being introduced into the market. EMP also recently displayed several technologies associated with the project, including a working prototype of an EnergySail and the EnergySail Automated Control System (ACS). In addition to ship owners being invited to join the project, EMP is reaching out to equipment vendors, classification societies and shipyards. The company is also looking for more investors and strategic partners to help support sea trials and commercialise various technologies. Companies already involved include Teramoto Iron Works, The Furukawa Battery Company and KEI System.